This black cowboy hat is perfect for creating dark cowboy costumes with it’s skull and crossbones emblem and black straw. It can also be used for dressing up as modern country/rockers such as Kid Rock. The black cowboy hat is colored as pictured. 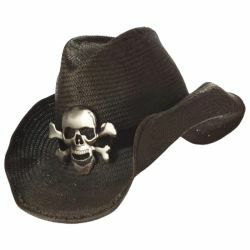 Hat is made of distressed black straw and has an attached silver skull and crossbones emblem. Hat is one size fits most up to a 23” head measurement.